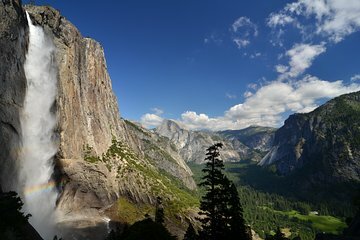 Salite a bordo del vostro veicolo di lusso per il viaggio al parco nazionale di Yosemite. Attraversa il Bay Bridge e attraversa la Central Valley fino ai piedi della Sierra. All'arrivo a Yosemite, incontra la tua guida per un'escursione alla base delle Yosemite Falls o esplora da solo. Noleggiate una bicicletta (a proprie spese) per navigare sul fondovalle, visitare la Galleria Ansel Adams o raggiungere la stazione dei ranger per lezioni informative e passeggiate guidate. Esplora il villaggio indiano di Ahwahnee o passeggia lungo le rive del fiume Merced. Successivamente, torna sull'autobus per tornare a San Francisco. Antonio was good. Informative. Very kind. The tour itself was great. We liked that we could visit the park on our own.Some of the stops will blow your mind. It would’ve been nice for the company to at least offer bottles of water and walk you through the property map. We got lost trying to figure things out, but it’s ok. We still had a wonderful time. Yosemite is incredible, but this company cheated us. Do not use it! When I was buying the tickets it listed many visitor points including Vernal Falls, Merced River, Cathedral Spires, Half Dome. None of these points was visited by the tour bus, you only see them from very far or from the moving bus. Other tours cost less and have the same. I chose this tour only for the comprehensive list of visitor points and the company lied! . Bus driver did not explain in advance that you can not visit all 19 points in the Valley where the shuttle goes, as many people hope, so the logistic needed to be corrected in the very last moment. Instead of advising on how to get to the point you need (for example, the lake), the driver pressed his own preferences - Indian village, in order for you to leave money in the local shops, probably((. The necessary warnings were not made by the driver regarding the route to go back to the bus parking to get there in time. Also, the bus driver was rude. We were looking forward to exploring the National Parks initially, however Rachid our tour guide was friendly, showed us all the great photo spots and nothing was too much trouble. He definitely made the experience one to remember - thank you. It was a very great trip in Fall period, I wish I could have more time to explore more. 3 hours free time is really not enough but good for just surveying all the places. I would reccomend 2-3 days to have more free time to enjoy in each spot. The space on the bus is comfortable and clean. The big windows on the bus is great for enjoying good view along the trip. Our bus driver Ray was great, very patient and professional, made several photo stops. There are free shuttles buses in the park, you can hop on and hop off to check some interesting places. Be prepare for 4 hours to ride one way, but it is interesting road. I had heard so much about Yosemite National Park, that I wanted absolutely the best when I went for the first time. And Gray Line did not disappoint. Right from the start, the tour was well-planned. The bus was comfortable and everything worked as expected, except for maybe the internet, but that was not a problem for me. The tour was timed just right so that I did not feel exhausted. It covered the most important parts of the park that can be expected in a day. Antonio was our tour guide and I could tell he is extremely passionate about his work. He was pleasant, helpful. He knew so much about the history of the park and the surrounding places. While going from San Francisco to Yosemite, he told us interesting facts about the various places and also shared his personal experiences. He stopped at the right time to ensure we were not bored. He made the touristy stops while heading to and heading back from the tour so that we clicked all the important places. Easily the best tour I have ever had and would definitely do Gray Line's extended tour of Yosemite. Outstanding. Super all day tour with plenty of time to view and enjoy Yosemite. Pleasant and knowledgeable guide. Absolutely recommend this tour. Do this tour, well worth it, you wont be disappointed. We had a pretty kind driver who entertained us though the whole trip. The bus was comfortable, had wifi and charger spots as well. 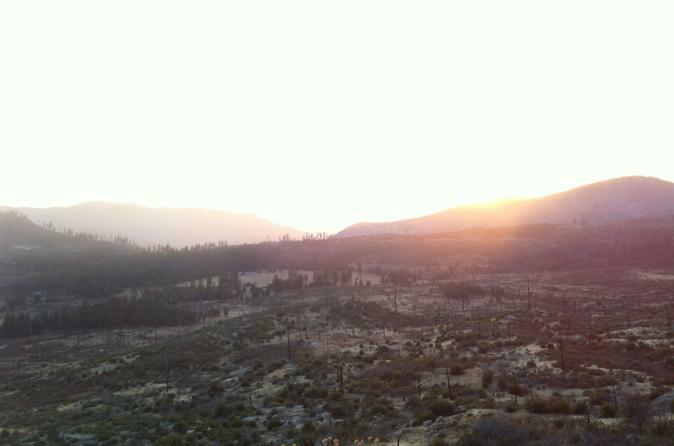 When I first saw the edge o the National Park, I felt very sorry and disappointed as it was burnt down. Inside the Park we had an exceptional view! I hope that the environment would be recover soon. Wow. that's what i have to say. One of the most amazing views I've ever seen. All of that, with a comfortable bus, a really nice driver, and with plenty of time to explore this magnificent park. Great value for money.